Yesterday I wrote about the importance of determining a few absolute rules with regards to eating. Soon I’ll be writing more about my specific rules (it’s important to choose the right rules, of course), but for now I’m going to keep it somewhat conceptual. Critical to the success of following any “absolute” rule is accepting that none of us is perfect. Completely depriving yourself of something you love doesn’t work in the long run. Sure, if you’re trying to drop a few pounds, you can make it work for awhile — but let’s think long term here. Any changes you make to your life have to be sustainable, else what’s the point? If you make a decision, say, to eliminate French Fries from your diet, but you truly love and crave pommes frites (and really, who doesn’t? ), at some point you’ll have a breakdown and gorge on a whole bucket of them. Willpower only goes so far. Eventually those cravings will win out. So here’s the magic bullet: Have one “cheat meal” each week, in which you can eat anything you want. 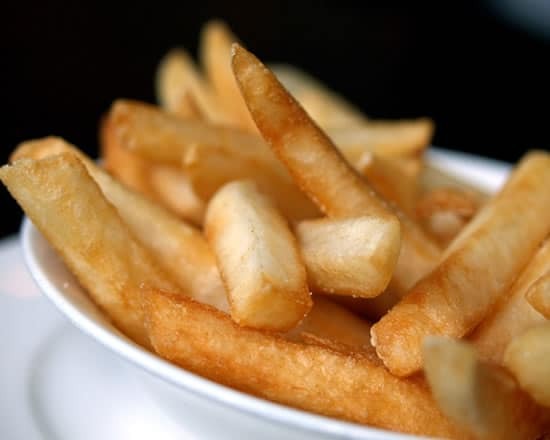 Go ahead and eat those yummy fries without any guilt, and without triggering a downward spiral. But you only get to cheat once a week. I love most foods so much, in fact, that I wouldn’t dream of not eating them ever again. I’m an artisanal foodie at heart. Heck, I even make my own cheese, and my closest compatriots make their own pickles and brew their own beer! Without the cheat meal, I’d be totally lost. But here’s the real beauty of this concept: I look forward to my cheat meal all week. It’s an important part of my life, and informs how I approach food all week long. It’s actually changed my relationship with food. When I do get to have that special meal, I appreciate it that much more. Those little potato morsels become a really wonderful treat that I savor and truly, deeply enjoy. I don’t mindlessly scarf them down just because they’re in front of me. In other words, I’m really making them count. I’ve also found that I’m more inclined to stick with my healthful eating when I know that at the end of the week I can have a fantastic meal of Anything I Want as my reward. It gives me something to look forward to (as if the weekend itself weren’t enough!). It also makes eating at restaurants infinitely more manageable. It doesn’t have to be on the weekend, of course. Use a day that works for you… and it’s fine if it changes a bit each week. One final thought: The cheat meal isn’t carte blanche to gorge so much that you make yourself sick. Yes, have those fries. But don’t have three plates of ’em! A little common sense has to factor in here. Keep it reasonable and keep it enjoyable. “Cheat Meal” is actually somewhat of a misnomer… because if you’re supposed to do it, it’s not really cheating, is it? Maybe it should be called a “Treat Meal”? I’m open to suggestions here… any great ideas on renaming the Cheat Meal? Post ideas in the comments, please! “French Fries” © 2006 umami, used under creative commons license. “Cheat Meal” is actually somewhat of a misnomer… because if you’re supposed to do it, it’s not really cheating, is it? Maybe it should be called a “Treat Meal”? I’m open to suggestions here… any great ideas on renaming the Cheat Meal? Post in the comments! I’ve been doing this for months and it does help to have one day off. As a calorie counter, it really gives me such a break. I did fall into the trap of going too extreme (bingeing), but I’ve gotten over that since I’ve backed off a bit on the “never have this again” mentality. I think your “cheat meal” should be called the “Thank God” Meal. I recently started calling my cheat meals “unrestricted meals” instead. I think Treat Meal is by far the best though. When I think of cheating, it makes me think I am doing something wrong, which leads me to want to eat more than I’m hungry for so that I don’t leave evidence of my terrible cheat behind. However, I agree that it is so right to eat whatever the hell you want to once in awhile. How about the Splurge Purge?